Dolch sight word bingo can be tons of fun and provide great opportunities to reinforce sight word recognition. 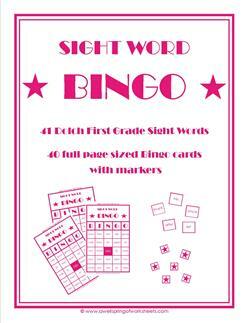 Each sight word bingo set includes 40 large 8 1/2 x 11 bingo game cards, star shaped markers, sight word cards, and instructions. Print all 40 game cards or just enough for the number of kids in your classroom. Use card stock for longer lasting game boards and pieces. Cut the markers and sight word cards out along the colored lines. 3 sets – pre-primer, primer, and first grade – color coordinated to go with the Dolch sight word flash cards and Dolch sight word lists. 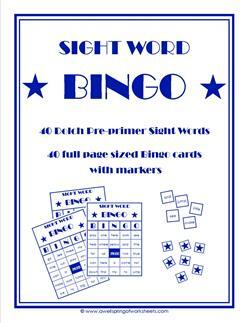 Color-coded in blue, this Dolch sight word bingo - pre-primer game comes with 40 full size pages, instructions, sight word game cards, and markers with stars. Just one more in this row and I'll have Bingo! Kids just love Bingo! 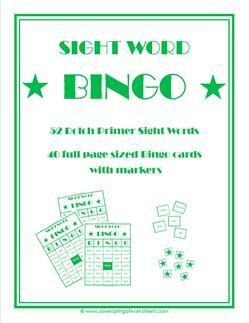 This Dolch sight word bingo - primer game includes 40 full size cards, 52 word cards, playing pieces, and instructions.